Wirikuta is a region in the desert of San Luis Potosí, Mexico that is considered by the Wixarika or Huichol indigenous people in Mexico one of their most important sacred sites. The Wixarika people are known worldwide for their unique visionary art and for proudly preserving their spiritual identity despite a destructive civilizing process of over 500 years. Each year, for probably thousands of years, the Huichol people make ? ?a pilgrimage that has, as its starting point, the Sierra Madre Occidental (specifically the states of Jalisco, Nayarit and Durango) where they live permanently. The pilgrimage culminates in the desert of Wirikuta and recreates what they consider to be the path of their ancestors. In the desert, the Huichol greet the sun, leave offerings and perform ceremonies that are designed to maintain harmony and balance on Planet Earth. Located in the plains and mountains of the Sierra de Catorce, in the state of San Luis Potosi, Wirikuta is a place of extraordinary cultural, spiritual and natural wealth. In 1999 UNESCO declared it one of the 14 sacred natural sites in the world to be protected. It is also one of the Natural Protected Areas of semi-arid climate with the highest biodiversity in the world. However, the Mexican government has conceded a large part of this region to companies that seek to exploit the mineral wealth of the area. This threatens not only the permanence of the semi-arid eco-system and biodiversity, but also the cultural heritage of the Huichol people. Recently Project Nuevo Mundo along with several Mexican environmental organizations such as Manos a La Tierra, Organi-K A.C. and the local team ‘Colectivo Patas Verdes’, organized a 3-day hands-on permaculture workshop that took place in ‘La Flor del Desierto’, a community ecotourism project located precisely in the region of Wirikuta. ‘La Flor del Desierto’ seeks to create sustainable economic alternatives to the proposed mining projects for the local population as a model of regenerative development, which benefits the ecosystem, economy and local society. In this type of workshop offered on site attendees help to beautify and condition the place so that the community can better accommodate travelers seeking to visit this unique and much sought after destination. Wirikuta is one of the semi-arid places on earth that has the most biodiversity and richness of cacti per square meter.With its unique biodiversity, this place is much more than just a desert, it is actually a garden.. In this sacred territory, which has won the hearts of thousands of Mexicans and people from around the world, there are at least 22 mining concessions that the Mexican government granted to the Canadian company First Majestic Silver Corp. Another company, The Universe Project aims to exploit mineral resources on 59.678 acres within the Natural Protected Area, representing no less than 42.56 % of the total area of Wirikuta. At the heart of Wirikuta is the Cerro del Bernalejo or Hill of Bernalejo. Known as the house of the deer or Kauyumari by the Huichol people, it is one of the most important points in their pilgrimage route where offerings are made that are believed to be essential for the preservation of harmony on earth. In this area, El Universo Project has four mining concessions that plan to be developed using the open pit method, which is undoubtedly one of the most devastating in environmental terms. According to reports from Mexico’s National Water Commission (CNA), large amounts of water that this type of mega mining requires could cause depletion of watersheds, many of which are already overexploited and are unlikely to recover. Additionally, the sacred springs where the Huichol gather their holy water are at risk of contamination with cyanide and heavy metals. Unfortunately, many of the inhabitants of the region have already been convinced of the benefits that mining will bring to their communities. And it is not difficult to understand why they were so easily convinced. Life in the desert is harsh, farming is hampered by the lack of water and many people have had to migrate to the United States and Canada in search of work and a better life. Mining offers secure paid work, the possibility to stay in their homes and return to an activity that grandparents and great grandparents held proudly. Since the emergence of the issue of mining in Wirikuta on international headlines, one of the most difficult challenges has been to successfully demonstrate the idea that sustainable jobs – such as those provided by ecotourism – can be a viable economic alternative to mining for the local communities. Permaculture as an alternative to mining. In this sense, ‘La Flor del Desierto’ is becoming a pioneer of community-run ecotourism activities in the area. Located in the heart of the desert, it has a history dating back to 1990, when a farmer discovered a source of hot thermal water coming from an underground spring. This discovery brought together a group of 15 families who then obtained government financial support to build a pair of cottages and a swimming pool on site. The construction was never fully completed and was practically abandoned during the last decade. Fortunately, the place and its people are currently in the midst of a renewal thanks to the support of different organizations and workshops that these have conducted here, helping to build two composting toilets, a new kitchen, a dining area and a small pool that feeds the hot water gushing from the spring. 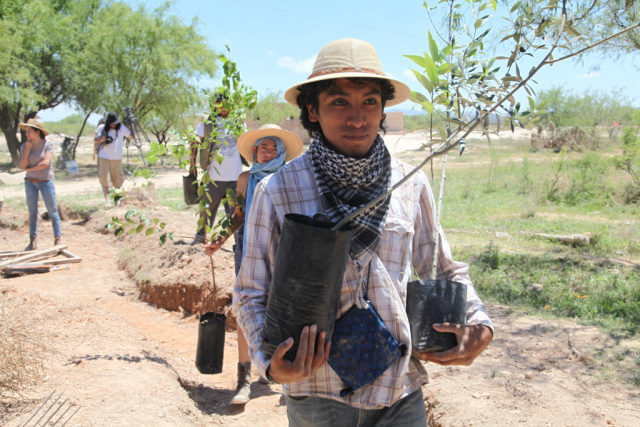 In addition, members of the Colectivo Patas Verdes, who live permanently in the neighboring town of Las Margaritas, have collaborated with the community to build a new community house where a women’s cooperative prepare natural cosmetics with various native desert plants . 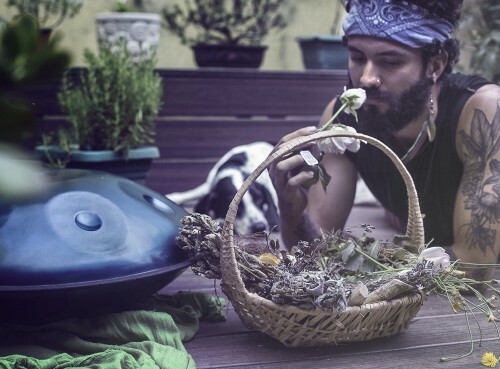 Permaculture, as a theoretical framework, refers to the application of certain rules or principles applied in the development of ecologically viable human settlements or ‘sustainable human settlements’. One of the principles of permaculture – apply small and slow solutions- refers to the idea of taking small steps to achieve large goals. In many circumstances, slow and small solutions can be applied in to prepare the ground for more long lasting changes. In the case of reforestation or restoration of soils affected by erosion, permaculture proposes techniques such as contour planting, terraces, swales, and bunds, all made by hand. These help to reduce erosion, increase recharge of groundwater and help irrigate the land, feeding orchards, crops and people. 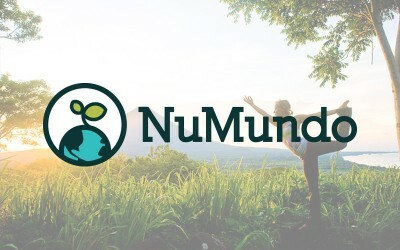 It was this permaculture principle that inspired Project Nuevo Mundo board member Gerardo Ruiz to plant a small edible forest under the shelter of native vegetation. The area where it was decided to place the forest has a relatively high humidity because of the proximity to fields that are irrigated regularly with water from the underwater spring. The idea was to use the water flowing into the fields to fill the swails or ditches that would be dug with the help of workshop attendees. The design materialized in the most recent workshop that took place over the course of three days. During the workshop volunteers helped to dig ditches and also plant different trees including olive, almond, peach, mulberry, figs, grapes, date palm, aloe, and others species that where selected for their resistance to dry weather an chilly winter nights. The idea is that the species that prove to be best adapted to the climate here will then be used to create an edible forest in a much larger scale. This will provide a source of food for the community while at the same time helping to regenerate the eroded soils. During the workshop, participants also had the opportunity to learn how to make the famous seed bombs, which are balls prepared from dirt, clay and a mixture of seeds used to grow edible plants for reforestation. The joy and satisfaction that attendees showed at the end of this workshop proves the feasibility of such projects in the region. The more people that come here and the better conditioned this place becomes; the more revenue will flow to the community. It is therefore of utmost importance to support this initiative and other similar projects in the region, in order to help the local population to achieve decent and sustainable livelihoods. The soon to be released film, “Huicholes: The last Peyote Guardians”, hopes to raise awareness on the issue and also seeks to fundraise to support local sustainability projects like ‘La Flor del Desierto’. There will be another volunteer opportunity in Wirikuta Desert during the month of July with Manos a La Tierra and will also be promoted thru Project Nuevo Mundo.